Editors' note: This blog post was written by Joe Landsberg and Richard Waring. 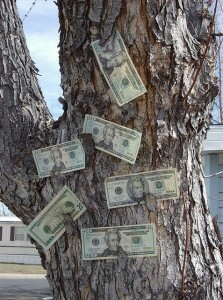 Money doesn't grow on trees—or does it? Photo by Fran, used under Creative Commons licensing. Economics are all about the values we put on things, and the money we will pay for goods and services of all sorts. In most cases the system is straightforward: people put a price on the work they do and the services they provide to others; materials are collected, things are manufactured, transported and sold. Profits are made (or not). Everyone has a reasonable idea of how the system works—although many of us might have a problem describing accurately the arcane functioning of the stock and financial markets. We might also have a problem describing the economics of forests. The commercial aspects are fairly simple: there are costs associated with land ownership, and they differ depending on whether the forest is privately or publicly owned. If it’s on private land, many owners expect some income from it; if on public land, and timber is sold by contract, a price is set through bidding on stumpage. There are management and operational costs, such as thinning for fire protection, wood harvesting, and transport. The returns on the wood product also differ. Is it for pulp or sawn timber or some other use? At some point processing costs and returns on the final product must be taken into account. All this can be evaluated and recorded in double-entry bookkeeping, including discounting to allow for the long time intervals involved in some forestry operations. The real challenge comes when we try to put values on forests for the non-monetary benefits they provide to our societies. Briefly, those benefits include: stabilization of watersheds and ensuring steady supplies of clean water; the maintenance of biodiversity and all its benefits; the absorption and storage of carbon, which helps mitigate the impacts on global warming of our profligate and dangerous emissions of carbon dioxide; direct mitigation of the effects of global warming; and, by no means the least important, places of beauty where it’s possible to escape the rush and bustle of modern life and get in touch with nature. It is not easy to assign monetary values to any of these aspects. We obviously can’t, in a short blog post like this, enlarge on and discuss all that (we have done so in our new book, so we encourage you to buy it), but let’s enlarge a little on those benefits. Obviously, they vary with forest type and location. Forests may not prevent floods when there is extraordinary precipitation, but they can and do stabilize catchments and watersheds. A great many landslips, all over the world, can be attributed to the removal of forests from slopes. Their role as sponges, holding water to be released gradually (and cleaned!) is not in question. 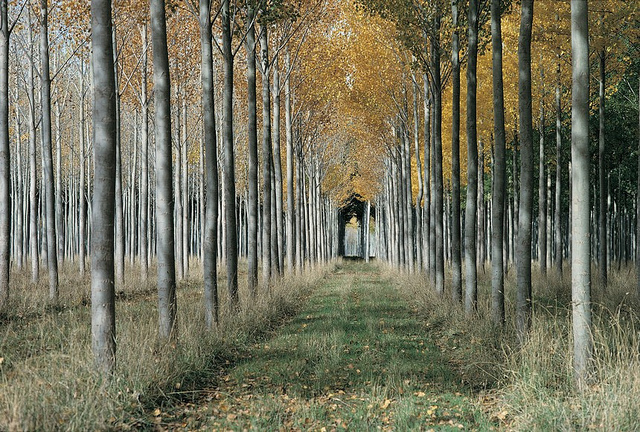 Tree plantations can be more susceptible to disease because they are monocultures. Photo by Tourism Victoria, used under Creative Commons licensing. The amazing biodiversity of tropical forests is immensely important. Those forests are the source of a great many of the medicinal (and other) drugs that we use, and the range of plants provides a gene pool that may hold the solution to some of the problems that we are generating in monospecific plantations, with their limited genetic base and consequent susceptibility to disease or insect attack. The temperate mixed forests that still cover large areas in the United States are also possible sources of invaluable genetic variation. The biodiversity of forests includes the wildlife that lives in them and passes through them seasonally—all sorts of birds, animals, and insects: the web of life. All important to a well-functioning planet. There is no question of the importance of forests in terms of carbon storage. On a global scale it’s massive, and very important as a buffer against rapidly rising carbon dioxide concentrations in the atmosphere. However, we do have to realize that the carbon is not stored forever. Plants respire and release carbon dioxide; biological material breaks down, releasing the carbon that is its major component. If we want to calculate the amount of carbon that would be stored by a forest in a particular location and its turnover time, we would have to have information about climatic conditions in the area and the forest type and age. 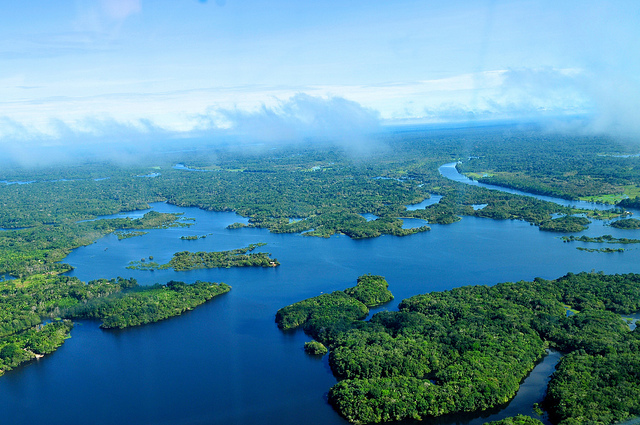 Forests in the Amazon and elsewhere help keep the planet cool. Photo by CIFOR, used under Creative Commons licensing. Direct mitigation of global warming by forests is largely a matter of the cooling effects of large areas of forest in hot regions. The physics are straightforward and the implications immense. For example, if the whole Amazon Basin were to be cleared, the already dangerous temperature rises caused by human activities would be increased by several degrees. And of course, its not just the Amazon where transpiration keeps the air cool; similar benefits can be felt along tree-lined streets in cities. It’s impossible to put values on aesthetics. We all have our own ideas and will all differ in the value we might place on beautiful forest scenery, or hiking in forested areas or (particularly in Scandinavia) collecting berries and mushrooms. But the value individuals might put on these things will be different from the value put on them by society as a whole. In the extreme case, if parts of a forest are held to be sacred by some people, to them those parts will be priceless. More generally, the amount people might be prepared to pay in additional taxes to fund the management of national parks and forests, may be strong indicator of their perceived economic value. Most economists are well aware that the demand for any product is influenced by the biases, emotional judgments, and subjective values of the product's consumers, which is very much the case in relation to the aesthetic values of forests. But it’s probably fair to say that the uncosted benefits are enormous—almost certainly, in aggregate, far beyond the straightforward economic values. It would be to the benefit of us all if that message was reiterated, loud and clear, to anyone who could influence, or bring pressure to bear on, those responsible for the ongoing destruction of forests round the world. It isn’t just a matter of feel-good, green tree hugging. It’s really important for all of us!